Katie J. Welch is an associate attorney in Dykema’s Chicago office where she focuses her practice on business and commercial litigation. 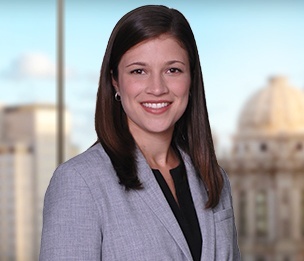 Ms. Welch graduated from the University of Notre Dame Law School in May 2018. While in law school, Ms. Welch served as a judicial extern for the Honorable John Robert Blakey in the Northern District of Illinois. Ms. Welch also completed an externship with the City of South Bend Legal Department where she advised on various issues related to building code enforcement and zoning. In her final year of law school, Ms. Welch worked at the Notre Dame Clinical Law Center in the Community Development Clinic where she represented clients in obtaining status as 501(c)(3) tax-exempt organizations.